The Dow Jones today looks poised to climb as the "Donald Trump stock market rally" continues to surge at a breakneck pace. Today could be the day the United States gets its biggest tax overhaul in 30 years. Republicans have been courting holdout Senators to push through the sweeping tax legislation. The vote is set for today, and markets are standing by. Yesterday, Republican Sen. Susan Collins announced her intention to support the bill. Should it pass the Senate, the bill would pass to the House of Representatives before landing on President Trump's desk. 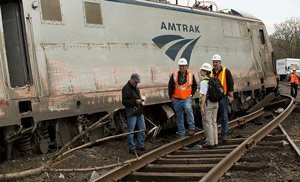 President Trump called for a robust infrastructure plan in the wake of Monday's Amtrak derailment near Tacoma, Wash. Trump has advocated for a national infrastructure program in order to create jobs, bolster U.S. growth, and improve the nation's aging bridges and roads. Congress is likely to explore a large infrastructure program in January if it's able to push tax reform through in December. Gold prices ticked slightly higher ahead of Tuesday's possible vote on tax reform. One ounce of gold is now trading at just above $1,266, creating an excellent opportunity for investors heading into 2018. North Korea leads a big list of geopolitical threats, while speculation on a massive infrastructure program will likely fuel concerns about the long-term stability of the U.S. dollar. For more reasons why we're so confident the price of gold will rally in 2018, read this. Crude oil prices rose due to the ongoing pipeline outage in the North Sea. Still, rising U.S. production is capping the possible upside caused by this outage. Later today, we'll get a sense of not just U.S. production, but also inventory levels. The American Petroleum Institute will report its weekly private inventory estimates today. The WTI crude oil price today added 0.5%. Brent crude gained 0.8%. The price of Bitcoin hovered near $19,000 while the broader cryptocurrency market continues to surge at an incredible rate. The total market capitalization of the global crypto market is now at $613 billion, a number that is now higher than both Amazon.com Inc. (Nasdaq: AMZN) and Facebook Inc. (Nasdaq: FB). Shares of Snyder's-Lance Inc. (Nasdaq: LNCE) are still climbing on news that it is selling itself. Campbell Soup Co. (NYSE: CPB) will purchase the company for roughly $4.9 billion. This is the latest effort by Campbell Soup to bolster its snack products. Shares of Longfin Corp. (Nasdaq: LFIN) plunged more than 12% in pre-market hours after the company's CEO said that its current valuation isn't justified. Shares of LFIN surged more than 228% Monday, bring its two-day rally to more than 2,500%. That's right… 2,500% in two days. The rally came after the firm announced it purchased Ziddu.com, a firm that specializes in the blockchain technology behind Bitcoin. Class A shares of Berkshire Hathaway Inc. (NYSE: BRK.A) have passed a remarkable milestone. Each share temporarily was worth $300,000 on Monday thanks to increased confidence in its CEO, Warren Buffett. The rally has come despite four consecutive quarters of declining operating profits. Shares are up nearly 23% on the year, beating the 20% return of the S&P 500. Investors anticipate that the Republican tax plan will benefit Buffett's conglomerate, which owns BNSF railroad, GEICO insurance, and firms that create Duracell batteries, Fruit of the Loom underwear, and World Book encyclopedia. Keep an eye out for additional results from Micron Technology Inc. (Nasdaq: MU), Red Hat Inc. (NYSE: RHT), FedEx Corp. (NYSE: FDX), Darden Restaurants Inc. (NYSE: DRI), FactSet Research Systems Inc. (NYSE: FDS), Navistar International Corp. (NYSE: NV), Worthington Industries (NYSE: WOR), and Steelcase Inc. (NYSE: SCS). Minneapolis Federal Reserve Bank President Neel Kashkari speaks at 1:10 p.m.